Looking back at my blog I realise that bits of the information about different aspects of our build are scattered through different posts, because I wrote blog posts as things happened - which wasn't necessarily in a coherent order. To rectify that I'd like to write a few posts recapping some crucial specific aspects. These will probably appear somewhat sporadically in between other things. 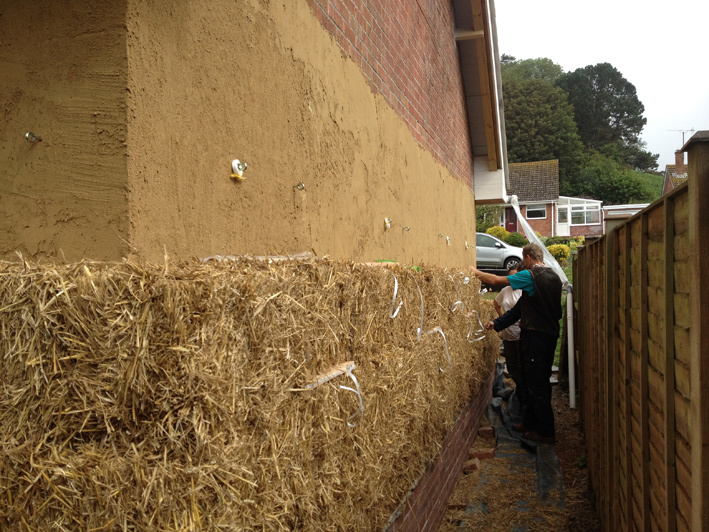 First up: using strawbales as external wall insulation. 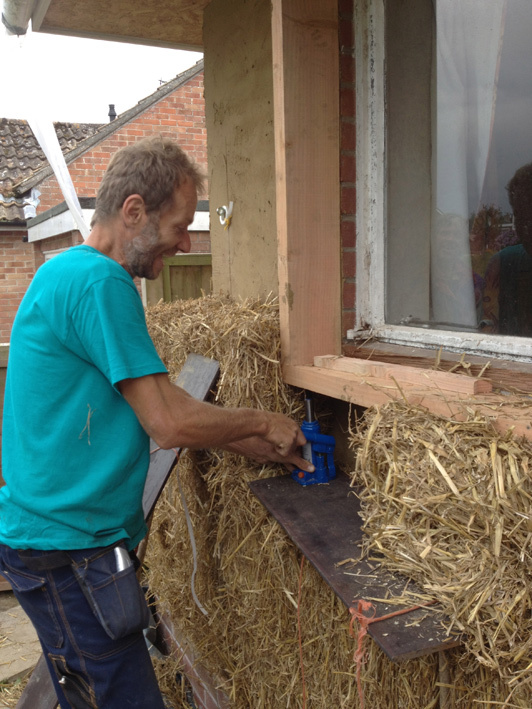 I'll be posting a blog soon about many of the good reasons to build with strawbale (an unusually fully-referenced blog, as it was written for the MSc course I'm currently on which requires much more rigorous justification of any assertions than has been my practice on this blog!). So for now, in brief: straw is a waste product (much more is produced annually than is needed for animal bedding etc. ), it is a good insulator (against noise and heat/cold), is much cheaper than other insulation materials, and it stores lots of carbon dioxide - so as long as your walls don't rot (and if they're well-built, well-detailed, and well-rendered then they won't) you'll be storing lots of carbon that would otherwise be adding to greenhouse effect. 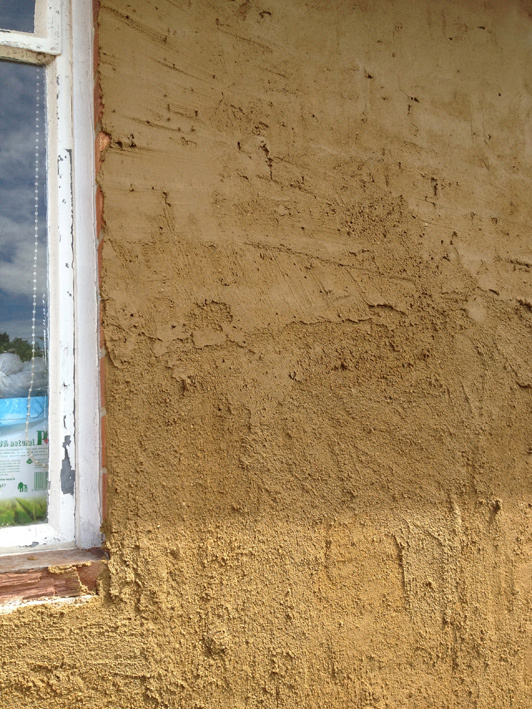 To reduce carbon emissions and energy use, it is essential to improve the insulation of existing buildings. 60% of household energy use is related to heating* - better insulation = less heating = reduced energy use = reduced carbon emissions. * UK Department of Energy and Climate Change figures, 2013. 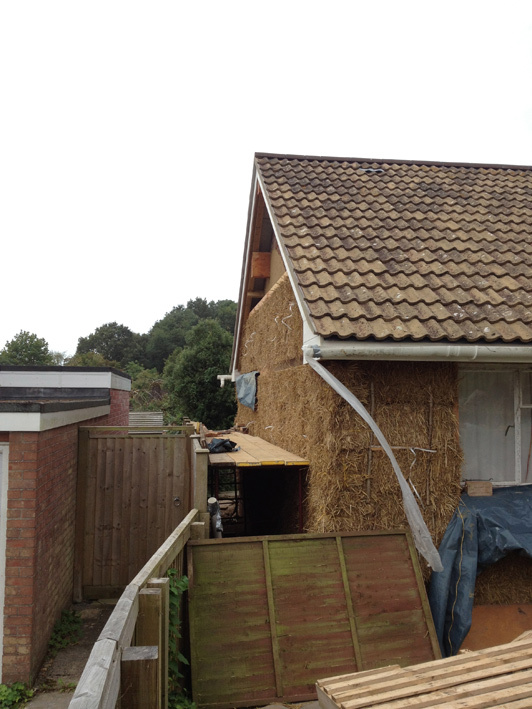 There are probably other ways to do this, but here's how we wrapped our bungalow in strawbales. Huge credit here must go to Jakub Wihan (Kuba) who advised us throughout, drew up the plans and constructions drawings, and came onsite to supervise the main bale work. We would have been utterly lost without him. 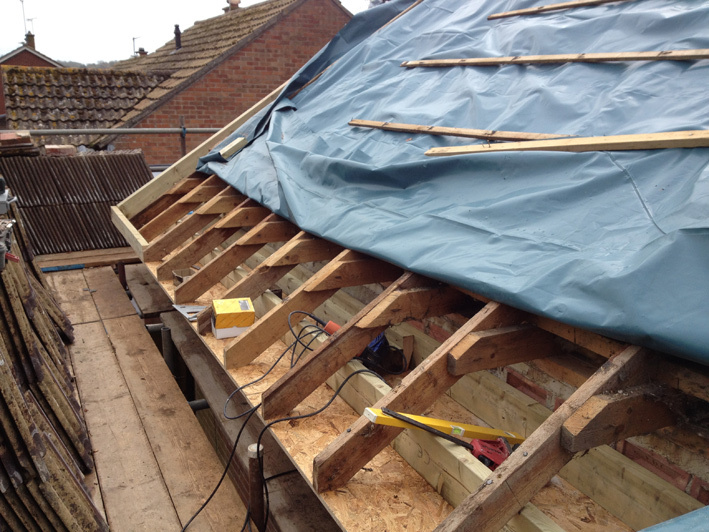 Above: another shot of the reinforced soffits, with new rafter at the far end to extend the roof over the gable, to allow wrapping of the wall there. 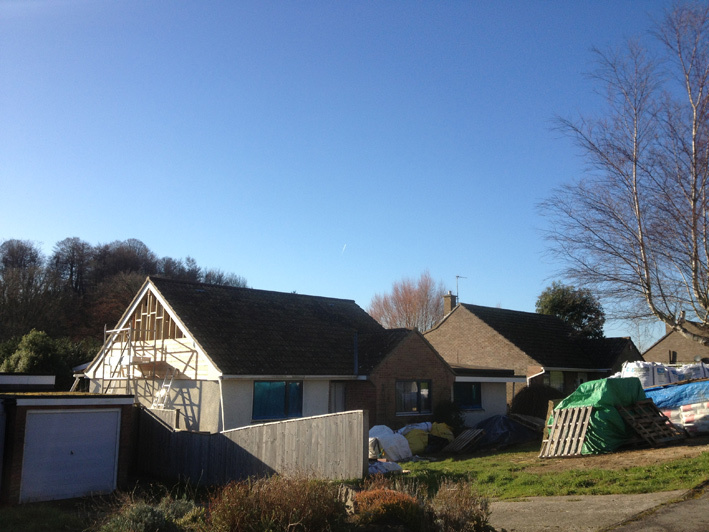 We were lucky that the bungalow already had large overhangs front and rear - it's good practice to have about a foot of overhang above strawbale walls to prevent rain ingress. Above and below: The bale walls require their own shallow foundations, to ensure the weight of the bales is supported. 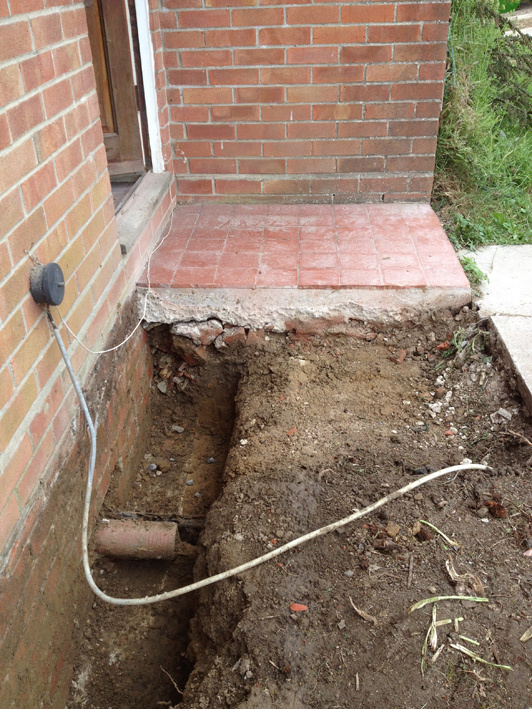 We dug as far as the top of the existing foundations and built back up from there. 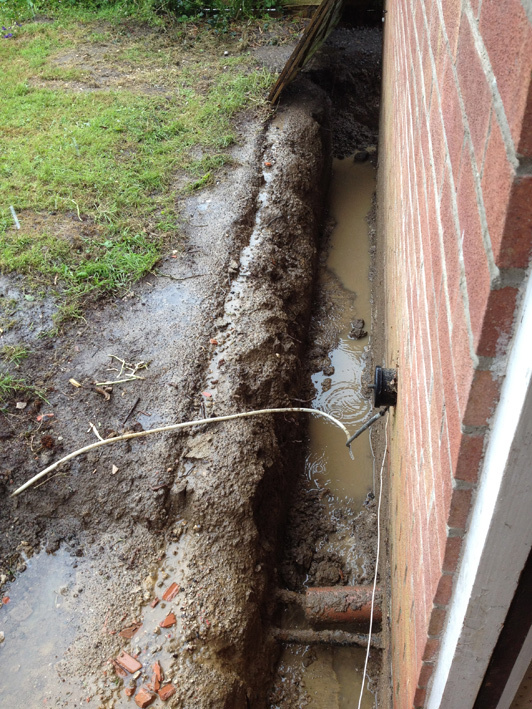 Foundations full of rain. We had a lot of this. 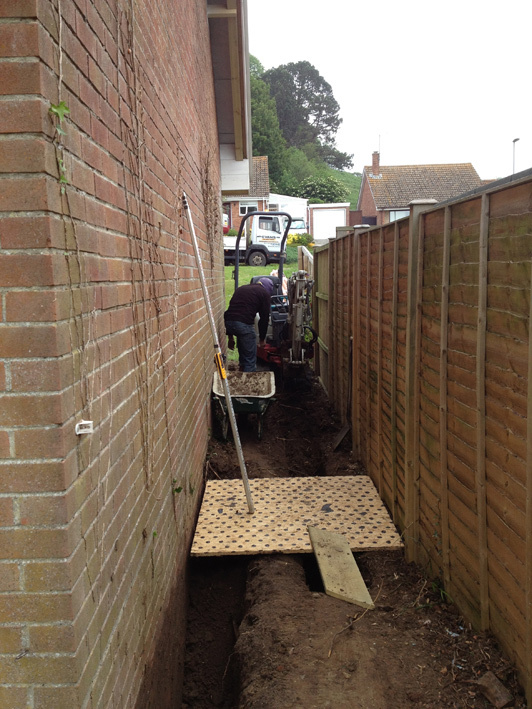 Digging foundations for the wrap in a narrow space. Note roof overhang above. 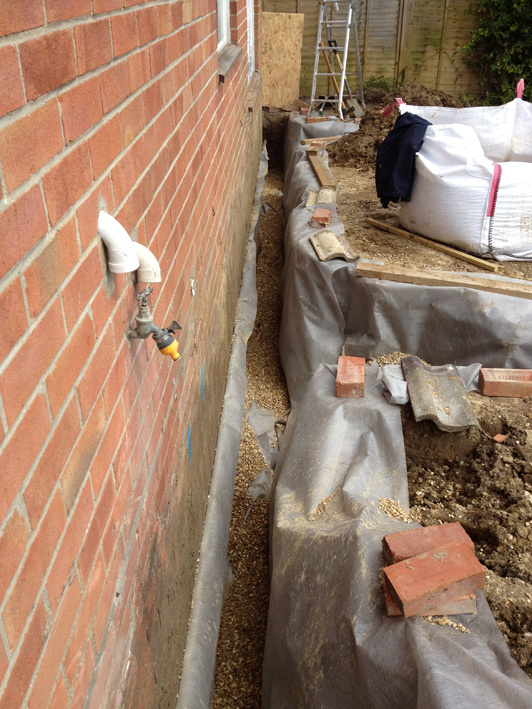 Above: foundations lined with geotextile to prevent clay soil washing into them and mixing with the gravel (see below). Above: cement-free foundations. 40mm clean (no fine particles) gravel, compacted in layers. Another layer of geotextile on top of the compacted gravel, then a 150-200mm layer of limecrete. 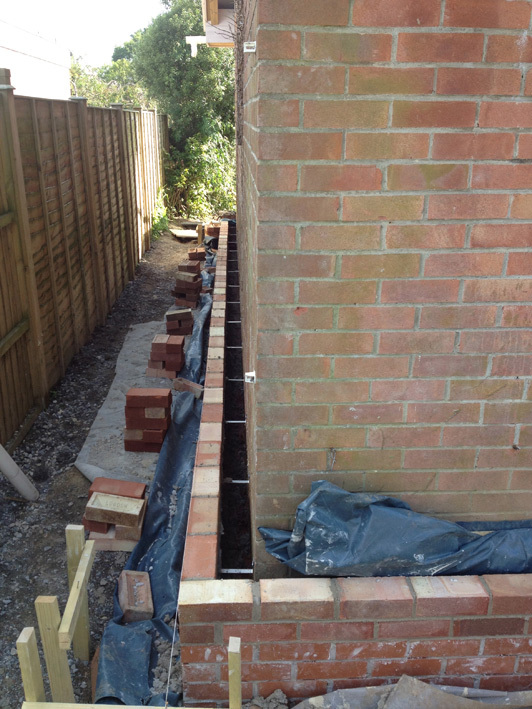 Lengths of reinforcing bar were resin-bonded into the existing wall before the limecrete was poured, to ensure the new foundations couldn't slide away from the existing walls over time. 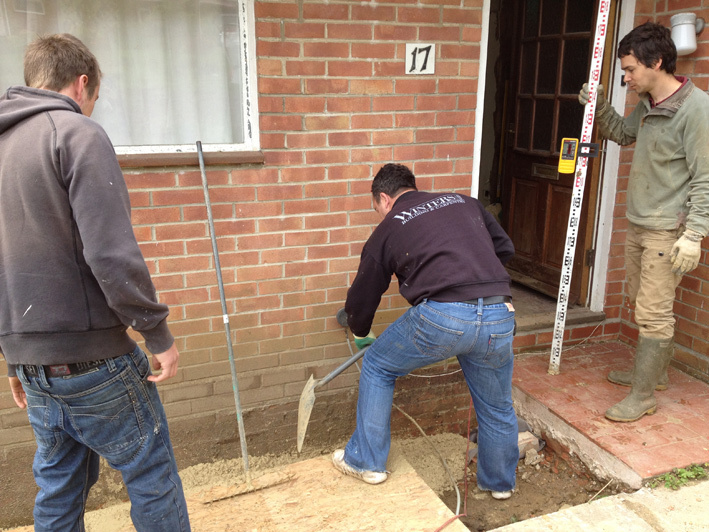 (That's me on the right, looking thinner than I am now, and looking on with site level in hand). 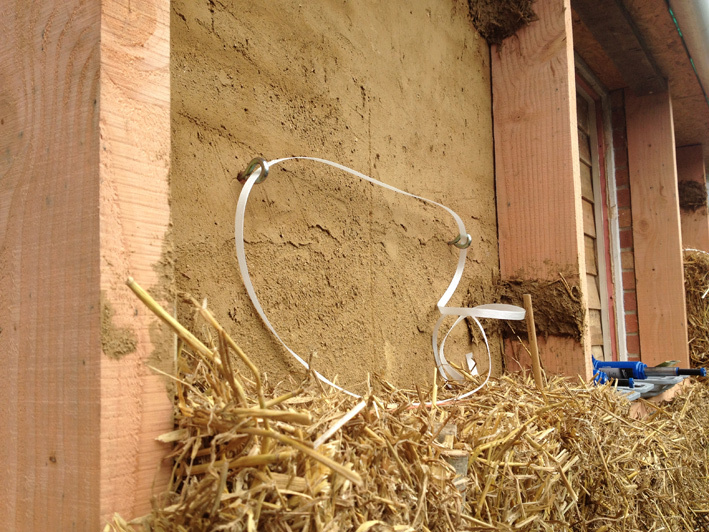 Another bit of standard strawbale best-practice: the bales should be raised above ground level to prevent potential for "splashback" rain ingress, especially at the join between bales and walls. It also raises them above any potential floods. We live up a hill but there's always the possibility of surface-water flooding. 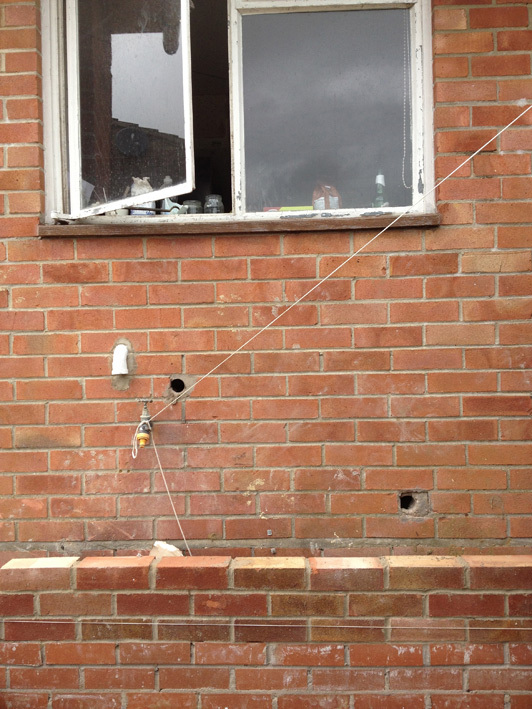 Above: Stainless steel wall ties were used to fix the new plinth-wall foundations to the existing wall. It's probably worth mentioning here that we decided to use half-width bales for the wrap - this would add a significant amount of insulation without resulting in excessively deep window-reveals which could restrict daylight. The bales were sliced between the two strings using a sawmill's big bandsaw. Above: a damp-proof course of reclaimed slate, bedded in hydraulic lime mortar. 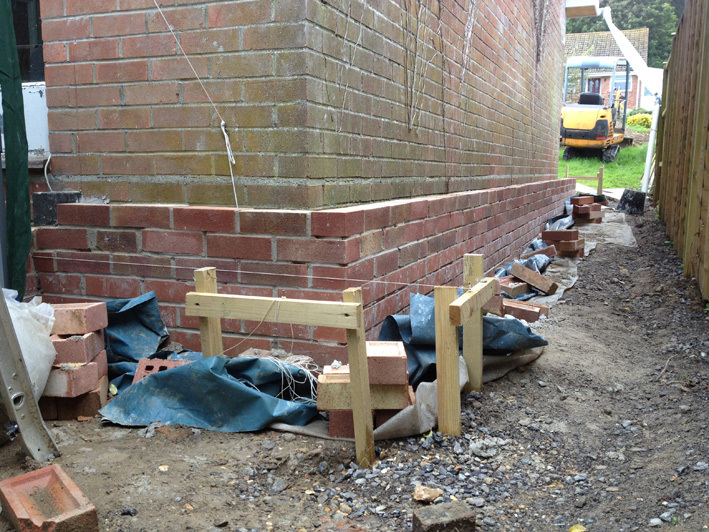 Pointing lines between bricks can allow airflow and rodent access; to prevent this this the walls were roughly levelled with clay plaster (made using clay dug from the garden during the ground works phase). 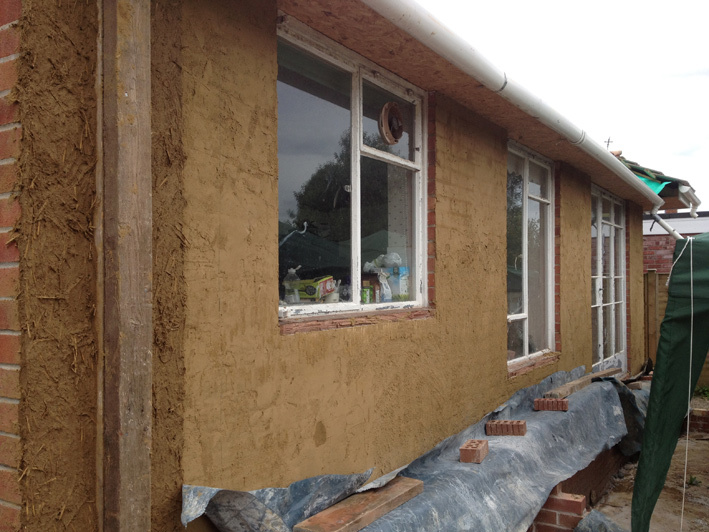 The clay plaster also acts as a humidity regulator to reduce the chance of condensation where the bales meet the bricks, though with external rather than internal insulation this is less likely anyway. 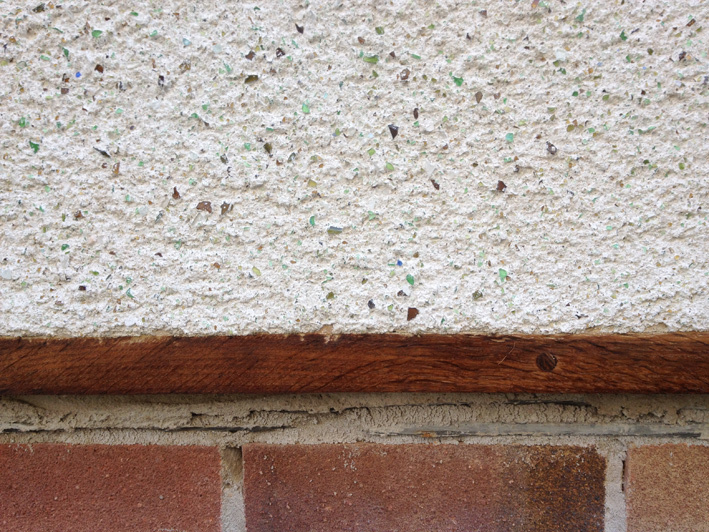 Above: The void behind the plinth wall was filled with compacted foamed glass chunks (like big chunks of Crunchie bar, made from aerated recycled glass) to insulate, reduce thermal-bridging, and prevent rising damp (the foamed glass is non-capillary). 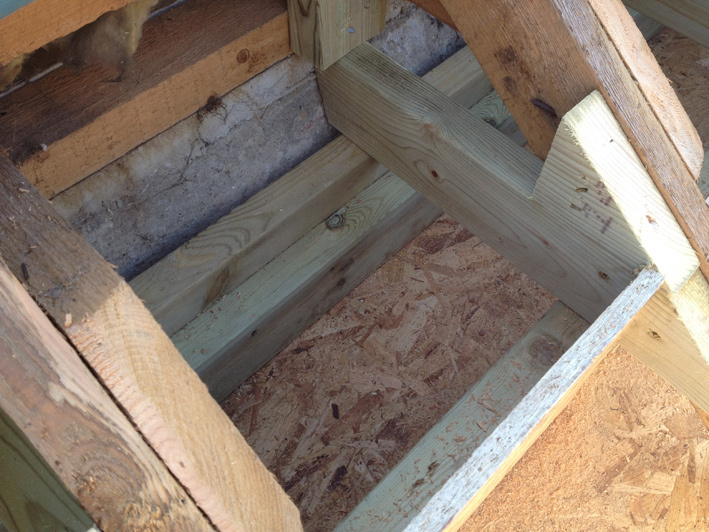 A timber base plate provides support for the bales, and the gaps in this are insulated with LECA (Lightweight Expanded Clay Aggregate). The masonry screw-eyes are used to tie the bales back against the wall (see below). 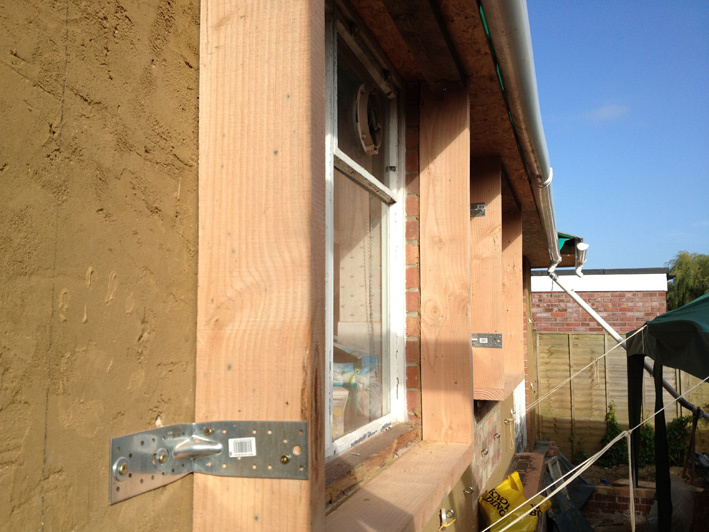 Above: durable UK timber (Douglas Fir) timber boxes fixed to the walls to provide a fixing for the windows, later. Above: Using a wood-carving blade on angle grinder, a groove is cut into the bales into which a hazel pole is fitted, in line with each screw-eye. Above: each pair of hazel poles is joined by a length of Douglas Fir batten, with a V cut into each end to slot around the hazel. The packing strap (previously threaded through the eye-screws in the wall) is passed around the outside of each pole, joined by a buckle on the douglas fir batten, and tensioned with a tensioning tool. 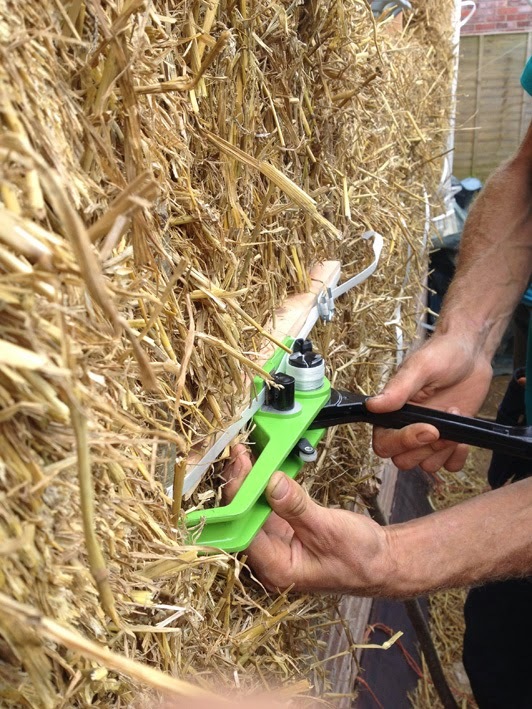 This clamps the bales firmly to the existing wall and provides some compression of the straw. Above and below: the height of the plinth-wall foundation was calculated so that the top course of bales would not quite fit. 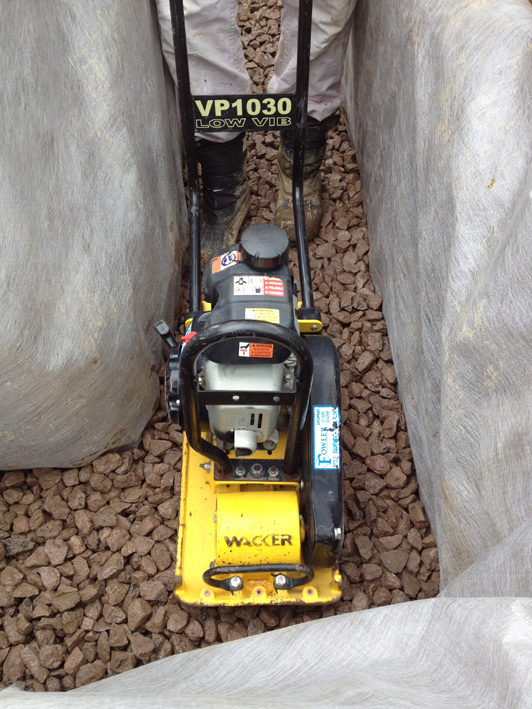 To fit the last bales, the penultimate bale is compressed using hydraulic jacks and a steel plate (shown below, compressing beneath a window box). 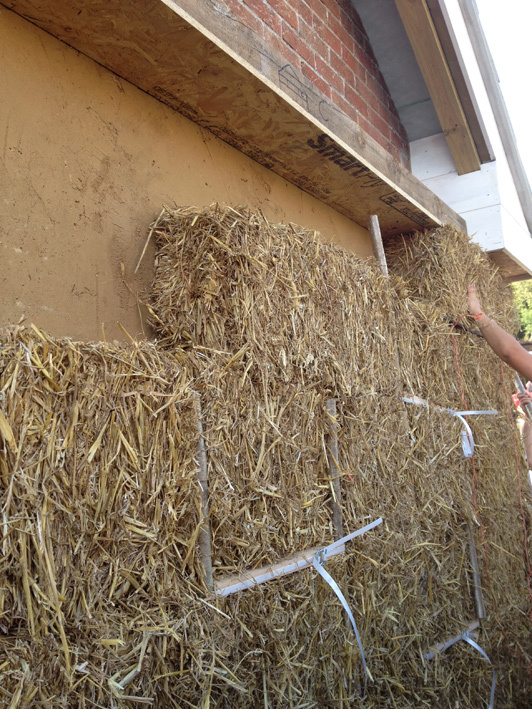 The plate is held in place by thin pieces of wood, the jacks are removed, and the top bale is persuaded into position. The plastic sheet acts to reduce friction between bales. The steel plate is then slid out (using string wrapped tightly around it). Above: small custom bales are made to fit under the window boxes. Again the course of bales below is compressed to fit these in. 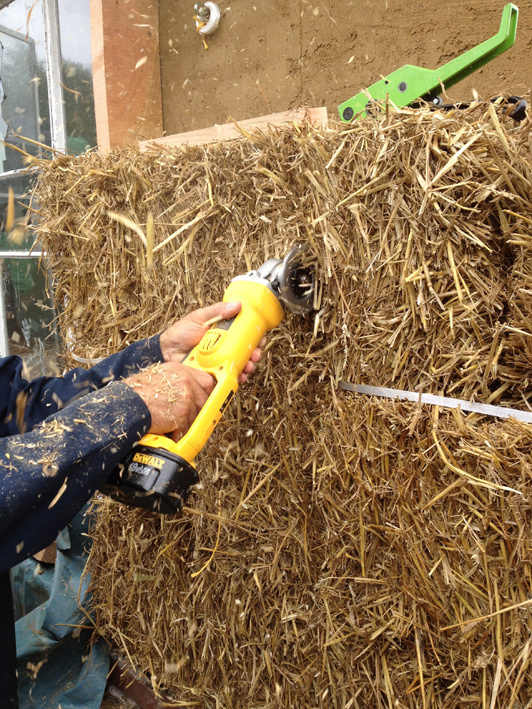 This is important as it results in a strawbale wall that is all slightly compressed. 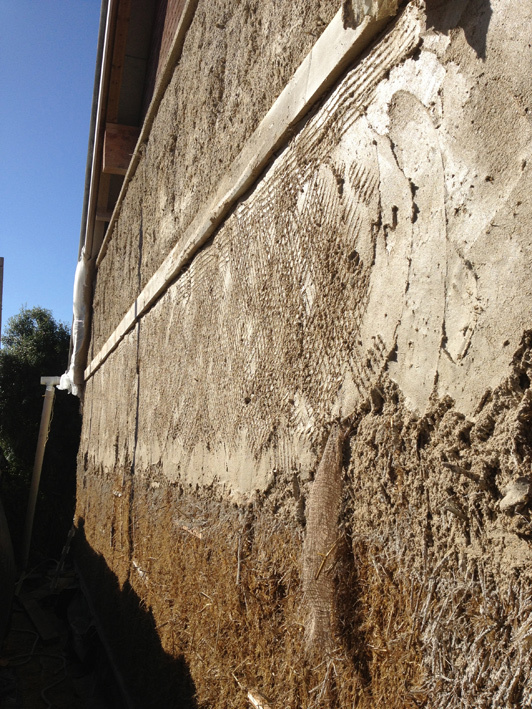 Compressed bales are stronger, denser, more stable and provide a much better structure to plaster onto. Above: the wrap up the gable wall. A strong timber and smartply wall plate provides a firm point to bale up to and to compress the bales down from. 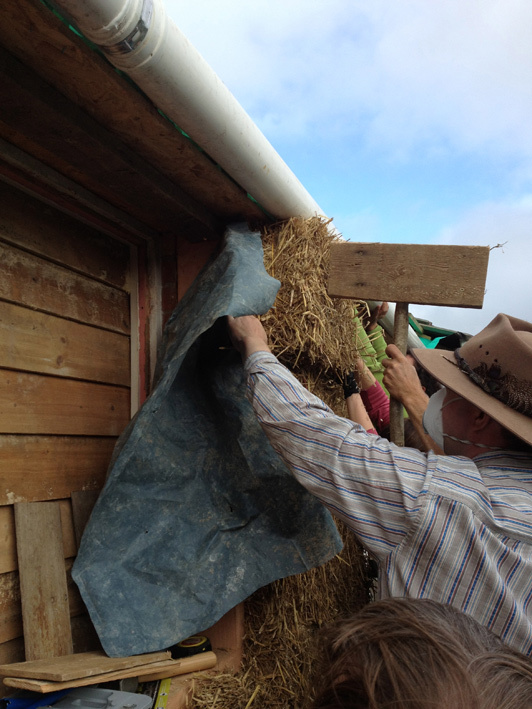 Above: Completed bale wrap on the gable. 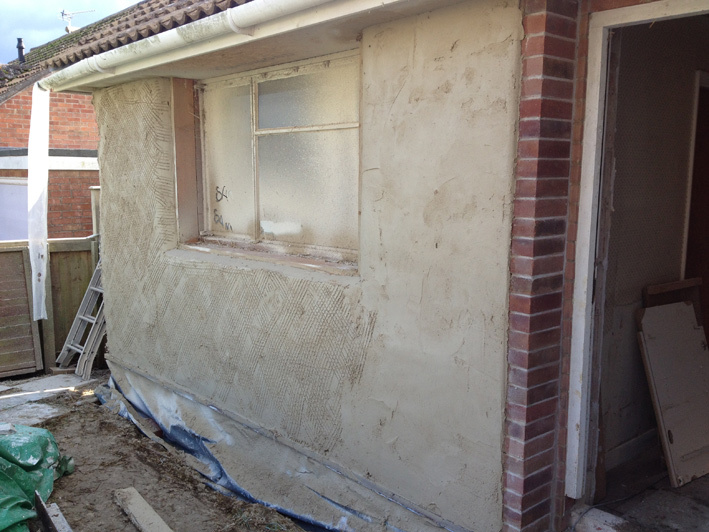 Above: if you are externally insulating a building with cavity walls, it is really important to insulate the cavity. 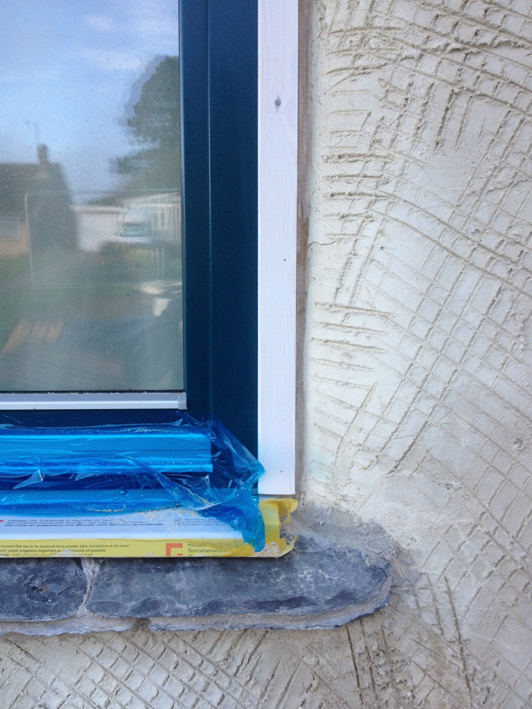 Otherwise air movement in the cavity could convect all your heat away, rendering the external insulation pointless. For various reasons we didn't manage to get this done first (probably bad organisation on my part...), so it was blown into the cavity from the inside. 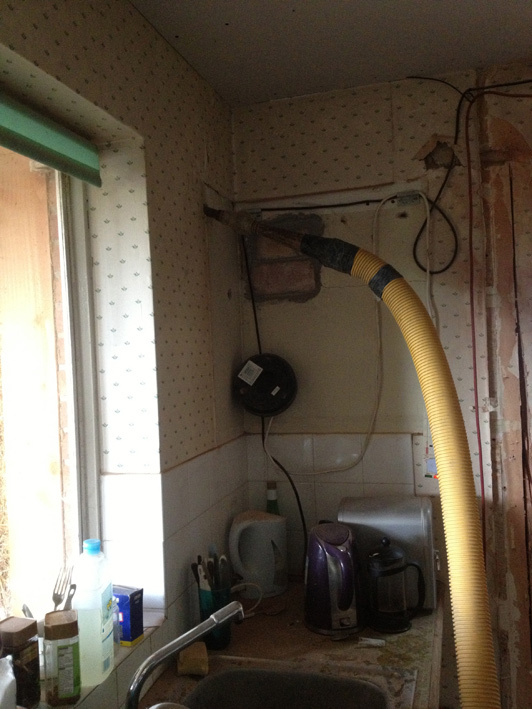 As this happened before any interior re-plastering this wasn't a problem. 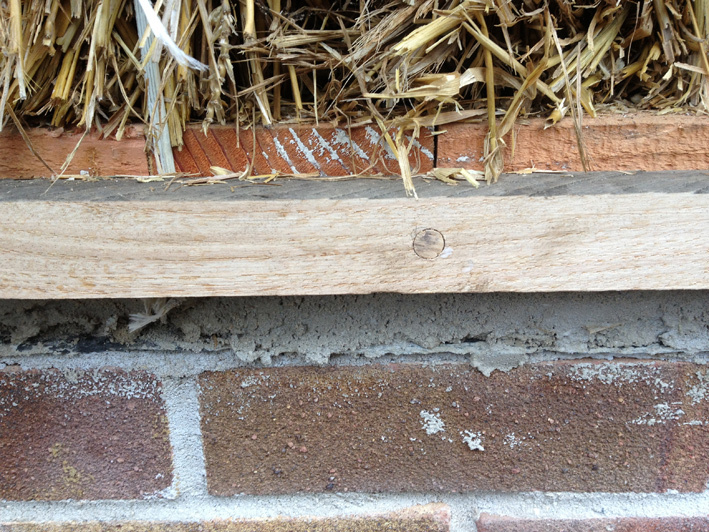 Above: Locally-sourced oak render stop (with drip groove beneath to prevent water running back into the wall). 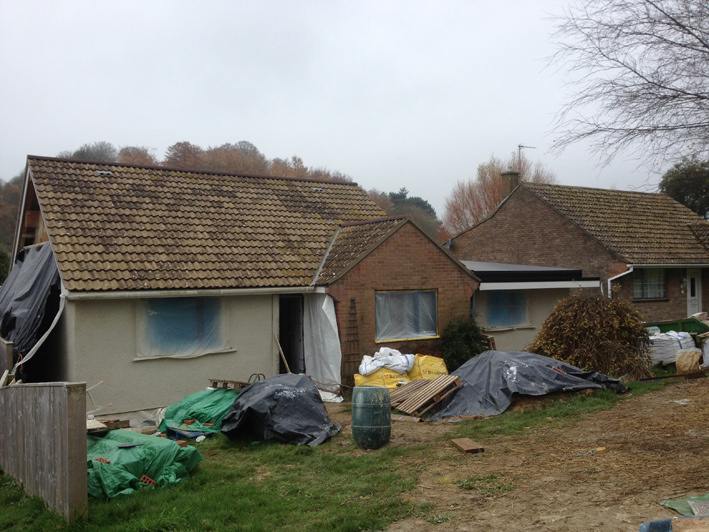 Above and below: scratch-coat of lime render going on. 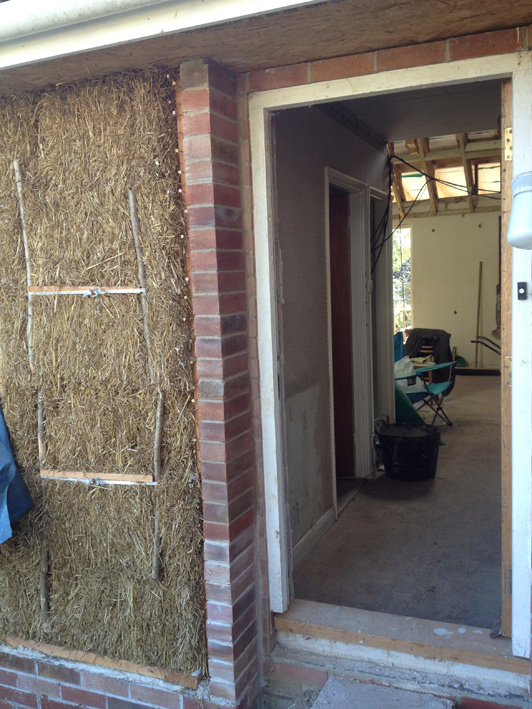 Hessian scrim used over all timber, hazel poles and strapping. 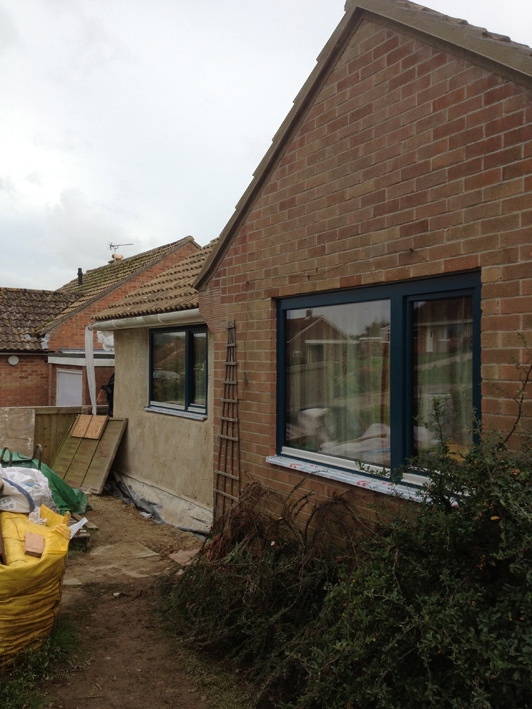 New windows, fitted into the timber boxes on the wrap. 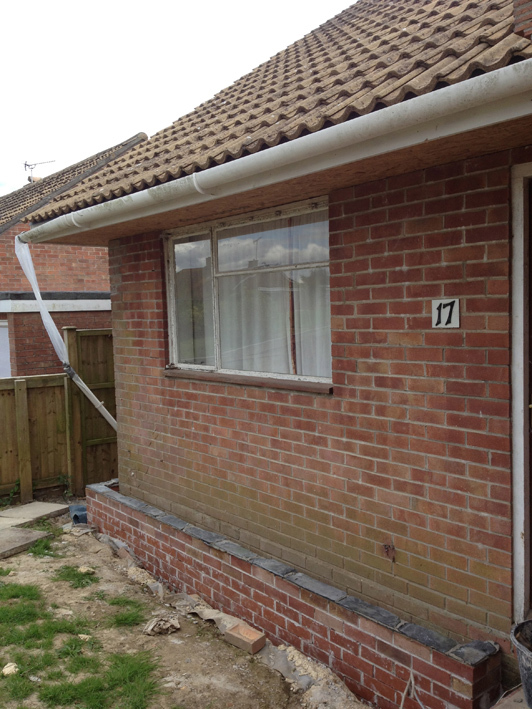 That brick section above was left as brick and internally insulated as a compromise with the planners - the bungalow is in a row of four identically-built ones, and keeping this brick section ties it visually to the others. 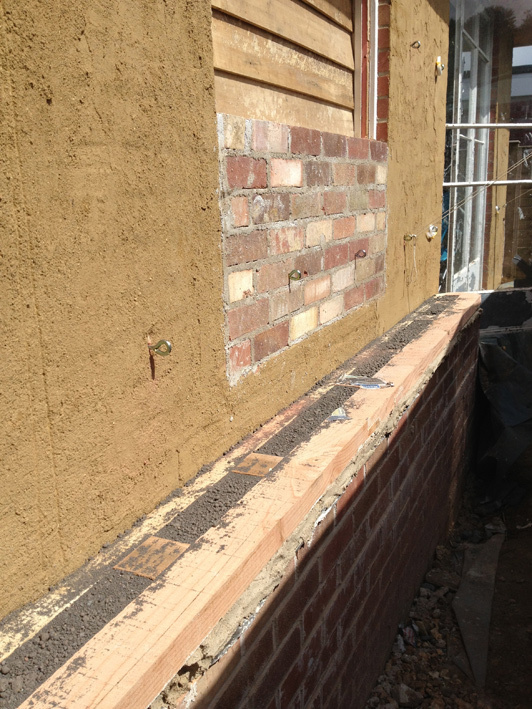 Above: reclaimed slate external sills, to shed water away from the walls. 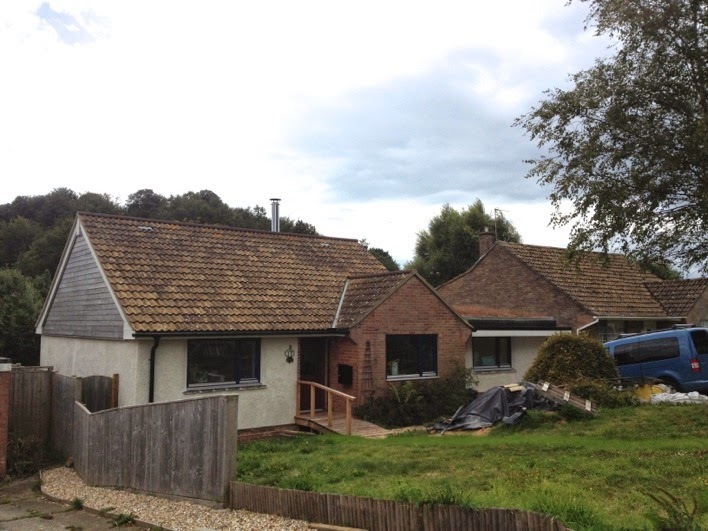 Above: completed render on both wrapped section and strawbale extension. 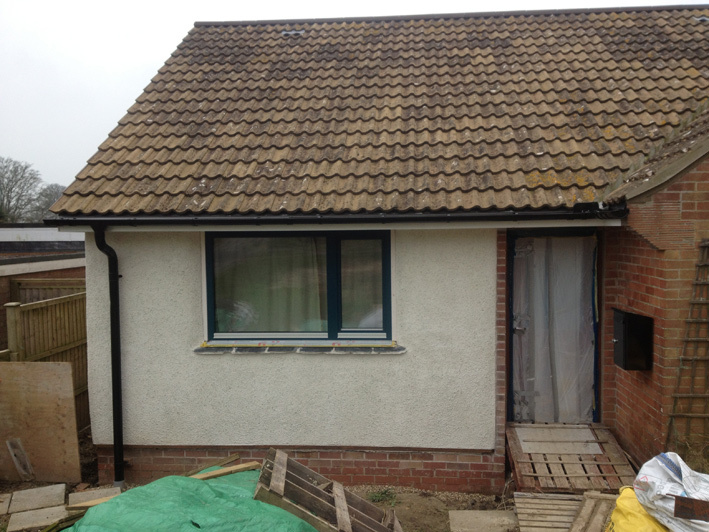 Above: completed render (lime and recycled glass) and oiled render-stop. Above: to avoid the need for a big roof overhang on the gable (which would have looked out of place in the street), the top half of the gable was clad with locally sourced cedar). Above: with new gutters and downpipes fitted at last. Above: complete wrap and extension! Hopefully not looking too different in the street scene. One day soon the front garden (and the rear one at that) will look more gardeny again.